We had some friends from the UK staying last week and, as is always the way, we seemed to fit in more visits to local attractions in that five days that we had managed in the previous five months. It was lovely being able to share some of my favourite Hobart spots with them – the view from the top of Mount Nelson, fish and chips at Maning Reef, and a lovely sunny walk in the Botanic Gardens – but the highlight for me was a trip out to Bonorong Wildlife Sanctuary. Here are a few pictures from the day. … but they woke up shortly after. 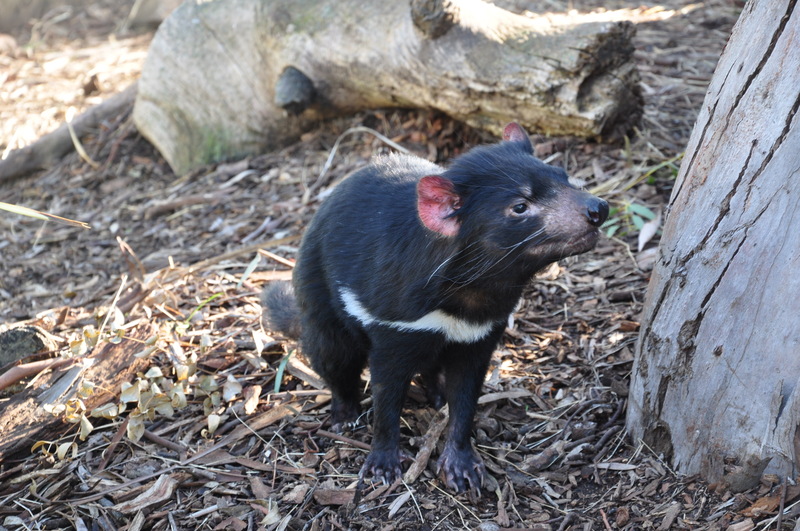 Devils are definitely my new favourite animal – they may not be the prettiest, but I could have spent all day watching their odd, awkward running. They are beautiful in a very clunky, snarly kind of way, and although they couldn’t have cared less about who was watching them I got the impression that they were full of personality. 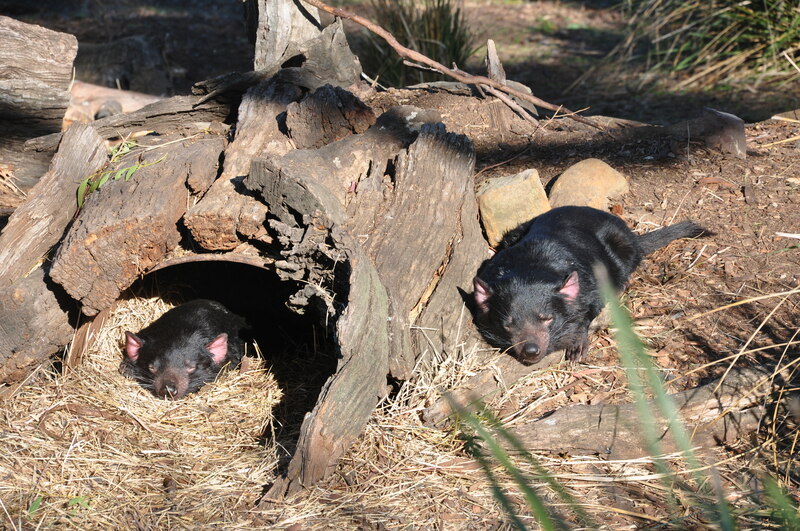 I like your attitude, little Tassie devils. 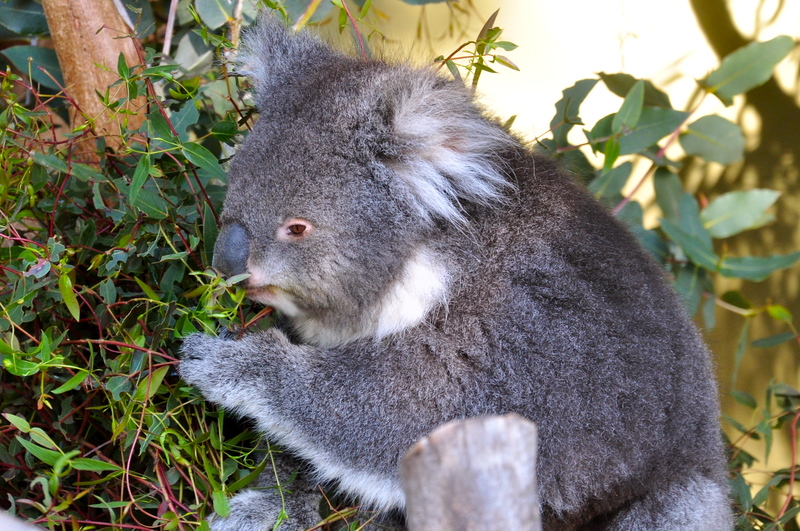 We were lucky to catch the koalas awake, and snacking on some leaves. When DorkySon visited Bonorong on a school trip last year he was able to touch the koalas, and told me later that their bottoms smell of gum leaves. As we just walked round ourselves and didn’t take part in a guided tour, I’m not able to corroborate that little pearl of information. 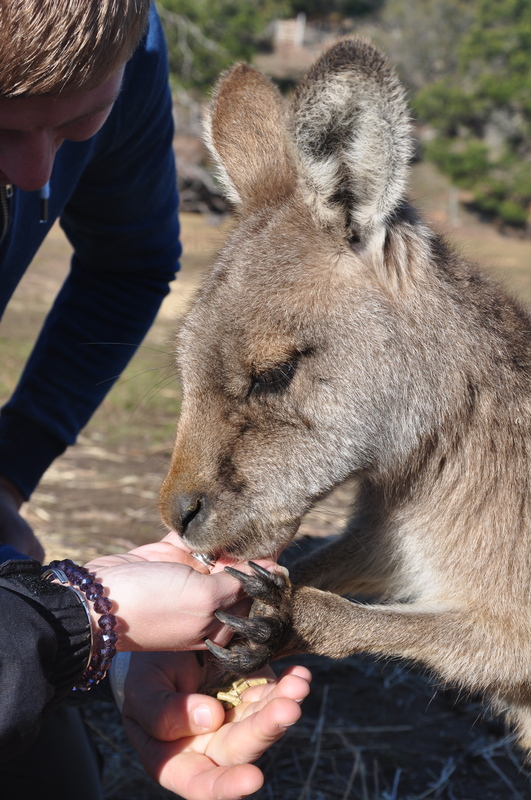 When you arrive at Bonorong you’re given a bag of food for the kangaroos, and you’re then able to enter their enormous enclosure and walk around to feed them by hand. This was really lovely, and a change from the wildlife park my friends had visited on the mainland where the roos were behind fences. 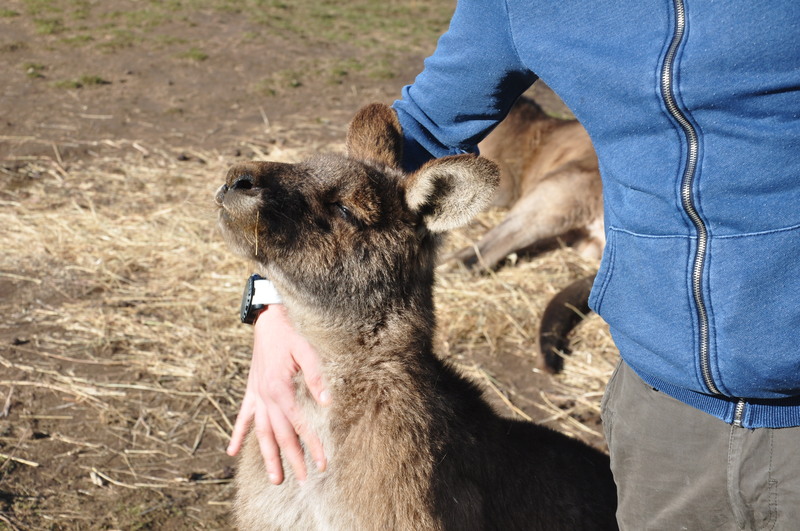 That said, it was also nice to see some big fenced off areas that were accessible to the kangaroos but not to visitors, so that when they’d had enough of having their chests scratched and their photos taken, they could hop off for some quiet time. They got quite blissed out after a good feed and some cuddles. 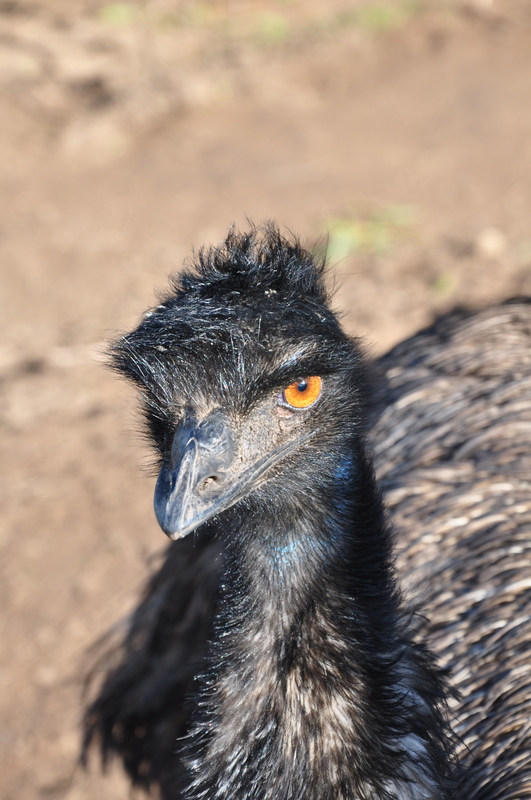 The emus made me laugh a lot. 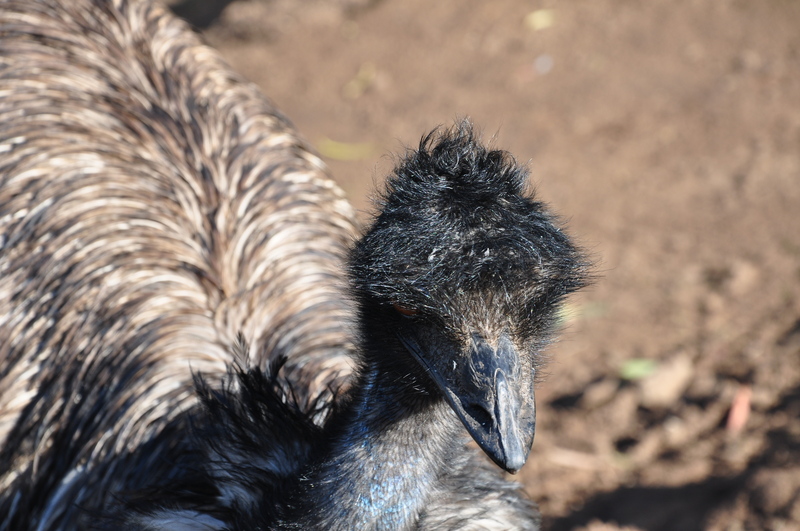 They had brilliant hairstyles and spent most of the time we were there ganging up on a goose that had unsuspectingly flown into their enclosure. 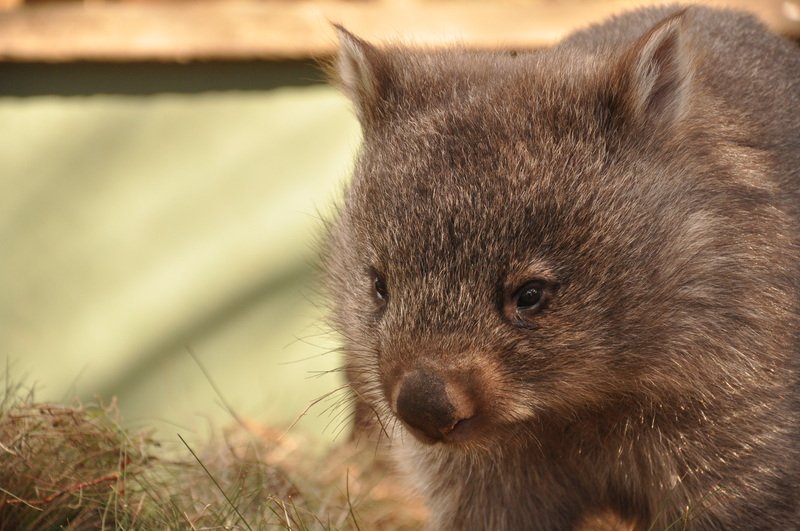 This is a wombat. My second favourite new animal after the devils. Despite its super cuddly appearance, there were lost of signs warning you not to touch as they can be a bit bitey. In the absence of human hugs, I was pleased to see that this wombat had a soft wombat toy to snuggle up with at nap time. This peacock was utterly unfazed by us, and seemed to just be enjoying its time in the sunshine – perhaps because just a couple of days earlier Bonorong had been covered in snow. Brrr. Because we visited in daytime and in winter there were quite a few animals we didn’t get to see, either because they were sleeping or hibernating. 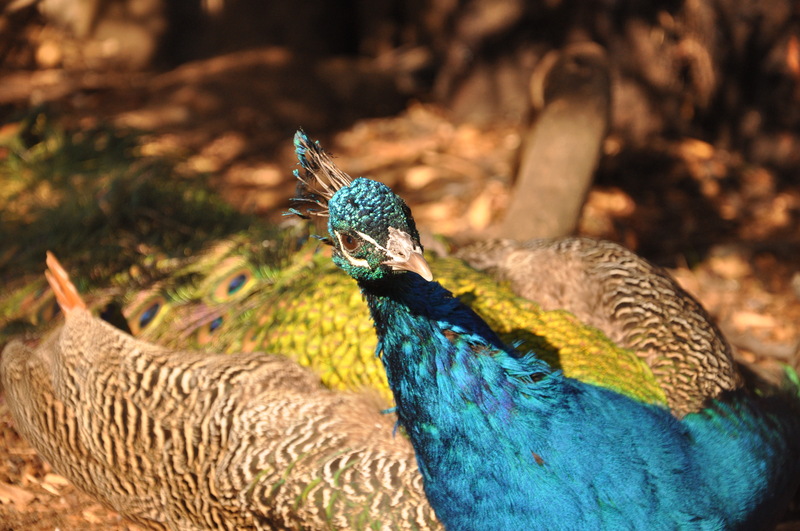 As well as the animals pictured above, Bonorong is home to quolls, possums, snakes, blue tongued lizards, and bettongs. The only one we were really disappointed not to see was an echidna, but after they left Hobart on Saturday to spend three days up on the Freycinet Peninsula, my friends sent a message saying that they’d seen an echidna in the wild, which was perhaps even better. 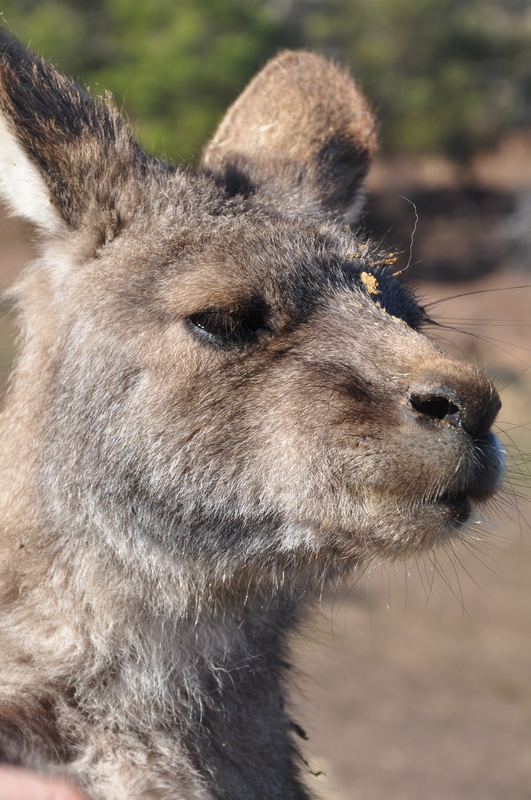 The lovely thing about Bonorong is how focused it is on the animals. When you have to wait a long time to be served in the gift shop because the staff member is on the phone taking details from a member of the public about an injured animal, and trying to co-ordinate a rescue for that animal, then you know you’re visiting somewhere that has its priorities right. We won’t be waiting for more UK visitors before we go back again. Here are links to some of the other writing I’ve been doing this month. “Earlier this year—like 2 million people before me—I read Marie Kondo’s book The Life-Changing Magic of Tidying. About a dozen pages in, I realized that it’s not a book written for people with children. There is neither the time in my life nor the space in my house to do things entirely her way.” – Marie Kondo, my son and me at The Mid. “If you went to the beach and there was already someone on it, you’d keep going until you found a quieter one… To be honest though, that never happened.” – 18 Signs You Grew Up in the Western Isles – Buzzfeed. Awwww Ruth I am so chuffed! I’ve been a reader of yours for a year or two now and just love your posts – I save them for when I have a quiet moment and always enjoy them, no matter the subject. This gorgeous post of my special workplace sums it up perfectly and your photos are so lovely! DorkySon is absolutely right with his koala fact – he most likely came on a school tour with myself as the keeper. I’m so pleased he retained that fact and many more I’m sure. Perhaps ask him about the wombat’s hard bottom?! That looks like a great place! I’m sure your friends must have had a wonderful time. Incidentally, I don’t want to boast, but I did see a koala move once when I was at a zoo. It stretched out an arm slightly to the left and took a couple of leaves. We couldn’t believe our luck, I can tell you. One to tell the grandchildren someday. The devils are great. Did you know that they have a reputation for being easy to handle with wildlife researchers? Apparently many of them treat the pipe-traps as a “devil retreat” – a handy place for a free feed and a cosy nap. They can be quite reluctant to leave! Possums are much more likely to give you a nip or a nasty scratch. Wombats have always fascinated me, and I have never seen a Tasmanian Devil till your photos. Well, and in the cartoons… 🙂 Looks like a lovely day to be with lots of furry friends!